The International Trade Center (ITC) unveiled a new web and mobile-phone application on December 14, that will help women entrepreneurs from across the world to connect to markets. 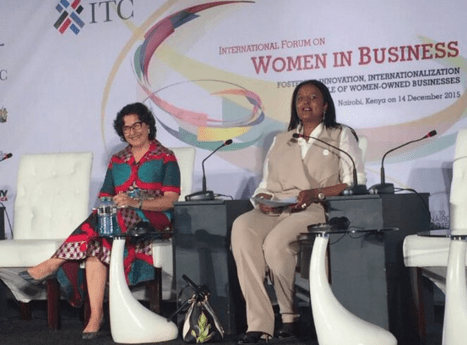 The SheTrades app was launched by ITC Executive Director Arancha González and Ambassador Amina Mohamed, Cabinet Secretary of the Kenyan Ministry of Foreign Affairs and International Trade, at the International Forum on Women in Business, which took place in Nairobi, in conjunction with the World Trade Organization’s 10th Ministerial Conference. The App is Part of a wider ITC initiative to connect one million women entrepreneurs to markets by 2020. SheTrades provides buyers across the globe with a unique platform to connect with women-owned enterprises. The platform is a tool for women entrepreneurs to address many gender-specific barriers to trade and brings together thousands of women-owned businesses to showcase their products in sectors ranging from agriculture to information technology. Through a series of customized filters, buyers can identify companies that meet their requirements. Developed by women entrepreneurs, for women entrepreneurs, SheTrades is a platform for connecting women-owned businesses with sourcing companies, including multinationals. SheTrades was developed by GreenBell Communications, following the company’s first-place win at the 2015 WVEF Tech Challenge. The challenge was a joint initiative by ITC, Google and CI&T to develop a digital platform to support the one million women entrepreneurs’ initiative. SheTrades allows women-owned businesses to connect to markets and internationalize, and enables them to share information about their companies, products and services, and connect with buyers. In addition, SheTrades enables buyers of products and services to filter and match themselves with companies and women entrepreneurs that meet sourcing requirements. Arancha González, said during the App launch that it facilitates new business opportunities and potential partnerships, and presents larger businesses with new sourcing possibilities, “The SheTrades tech platform offers an opportunity for women entrepreneurs to leverage 21st century technology offered by mobile phones and the internet to reach out, find buyers, to internationalize and scale their businesses,” Ms González said. You can register your business on the platform. The app is also available on the Google Play store. ITC is a 100% Aid for Trade institution with the knowledge and experience to encourage entrepreneurship and empower small and medium-sized enterprises (SMEs) to integrate into regional and global value chains. Separator image Posted in Her money and tagged with 2015 WVEF Tech Challenge, GreenBell Communications, ITC, SheTrades app, Women Empowerment, women entrepreneurs, Women in Business, WTO.